In the four years since I was hurt by ciprofloxacin, a fluoroquinolone antibiotic, I have often fantasized about what I would say to the FDA if I had chance. Would I tell them about the pain and suffering I experienced after taking ciprofloxacin? Would I tell them stories about my friends who have had their lives wrecked by fluoroquinolone toxicity? Would I share with them the knowledge that I have gained from obsessively researching fluoroquinolone toxicity? Would I berate them and yell, “Do your ^%^& job?” Would I beg them to, at the very least, keep these dangerous drugs away from children? 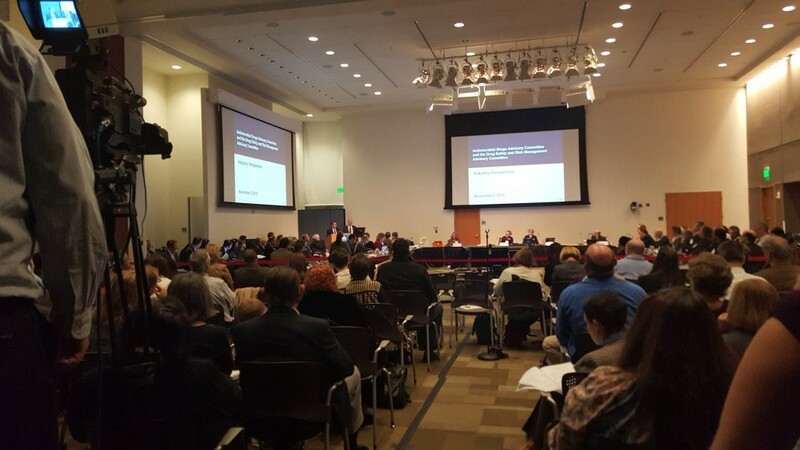 On November 5, 2015, I had the opportunity to testify before the FDA’s Antimicrobial Drugs Advisory Committee in a meeting specifically to address the risks of fluoroquinolone antibiotics (Cipro, Levaquin, Avelox, Floxin, and their generic equivalents). I, along with thirty-five other people, testified, and I chose to note the damage that ciprofloxacin did to me and to point out some of the mechanisms through which fluoroquinolones hurt people. 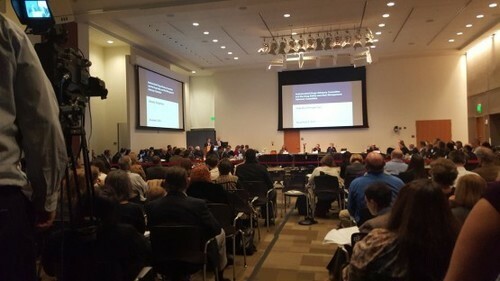 Others gave poignant and heart-breaking testimonies about the loss of their health, or the loss of their loved ones, and a few doctors and consumer advocates testified as well. You can read some of the presentations that were provided to the FDA committee in THIS POST. I am happy to report that the meeting resulted in an overwhelming victory for victims of fluoroquinolone antibiotics. The committee ruled that the current warning labels do NOT appropriately address the risks associated with fluoroquinolones for treatment of sinusitis, bronchitis in those with COPD, or uncomplicated urinary tract infections. This is a HUGE step in the right direction, and it is my sincere hope that it will result in the FDA dramatically cutting the number of unnecessary fluoroquinolone prescriptions, and better treatment for those who are suffering from adverse reactions to fluoroquinolones. That acknowledgement from a FDA committee, that fluoroquinolones cause a disabling constellation of symptoms in previously healthy individuals, is a HUGE victory for victims of fluoroquinolones. Next, the committee will make recommendations to the FDA. Presumably they will recommend that the FDA update the warning labels to note that the constellation of symptoms associated with FQAD, so as to educate physicians and patients of the risks of this class of antibiotics. The FDA may enact other means of more properly addressing the risks associated with fluoroquinolone use, such as enrolling fluoroquinolones in the Risk Evaluation and Mitigation Strategies (REMS) program. Several FDA committee members mentioned the need for further studies of fluoroquinolones, and hopefully some long-term and intergenerational studies will be conducted. I hope that the FDA does all of these things, and that fluoroquinolone use is curtailed significantly. More than 23 million prescriptions for fluoroquinolones were dispensed in the U.S. in 2011 alone, and as many as 90% of those prescriptions were inappropriate given the true risk profile of fluoroquinolones. We shall see if the FDA does anything with the information that was presented to the committee, and what they do with the committee’s recommendations. Other groups of patient advocates who are interested in replicating the success of “floxies” in getting a favorable ruling from a FDA committee may be wondering what caused the FDA to look at fluoroquinolones. I believe that the FDA’s decision to hold the committee meeting was a culmination of several factors. First, people have been reporting disabling reactions to fluoroquinolones to the FDA using their adverse event reporting system (FAERS). I encourage everyone who has experienced an adverse reaction to a drug or medical device to file a report with FAERS. Second, more than 150 news stories about the dangers of fluoroquinolones have aired in the last two years. You can view them through THIS LINK. The news stories were prompted by the persistence of victims of fluoroquinolones reaching out to their local news stations. Third, two citizens’ petitions have been filed with the FDA. One notes that serious psychiatric adverse effects can be the result of fluoroquinolone use. Another petition notes that mitochondrial toxicity should be added to the warning labels for fluoroquinolones. Fourth, concerned citizens met with the FDA to discuss the dangers of this class of drugs. Basically, people have been screaming at the FDA through multiple venues demanding that they hear us. At the committee meeting, they heard us. I encourage everyone who has been hurt by a drug or medical device to report their story to the FDA, to tell their story loudly and persistently through the media, and to organize social media groups so that your message is spread far and wide, and heard loud and clear. “Floxies” have come a long way in getting the dangers of fluoroquinolones recognized by the FDA, but we still have a long way to go. As nice as acknowledgement and being heard are, action is needed to get what we really want—change in how fluoroquinolones are viewed and prescribed. We are moving in the right direction. One step at a time, and we will reach our goals of prudent and appropriate use of fluoroquinolones, as well as healing for those adversely affected by these drugs. Information about the author, and adverse reactions to fluoroquinolone antibiotics (Cipro/ciprofloxacin, Levaquin/levofloxacin, Avelox/moxifloxacin and Floxin/ofloxacin) can be found on Lisa Bloomquist’s site,www.floxiehope.com. Allergic Reactions or Iatrogenic Illness? This is making steps forward. I still can’t fathom how our government will recall, and prosecute corporations that are involved in massive recalls for automobiles, food, and other consumer products. It seems somehow Big Pharma is immune to the damage they do. A double standard exists for the medical community. They are protected while corporations like GM and Takata are fined billions of dollars. Thanks for your work. My case was one of the many they considered in making these decisions. Hopefully we can keep pushing until the drugs are pulled from the market and the corporations held liable for the lives they are destroying. Yeah, Chris, it boggles the mind. I even said in my statement to the FDA (nov hearing) that GM was forced to recall millions of cars after 7 deaths…yet perhaps as many as 300,000 deaths means nothing, because it is big pharma? I posted on the FDA Face Book page. I encourage others to do the same. My husband was a victim as well. 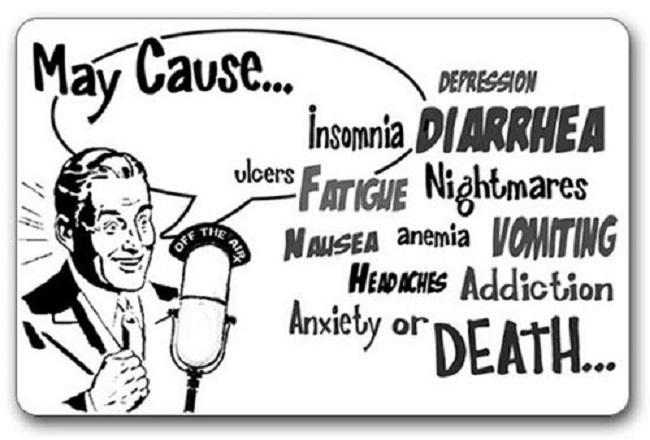 In addition to the Floxie recovery, have you received any valuable medical care in the treatment of symptoms? example: my husband has peripheral neuropathy and I want to find him an orthotic or other such help. Have you had any luck with anyone or anything? Great story. A couple of additions if I may. 1) I have a petition with the FDA for over a year now asking the limitation of quinolones use for emergency only. I have received a response from them earlier this year that they had not been able to make a decision on changes because there are many factors involved and it is complicated. The original petition is here with only 16 comments! I would like to encourage all who were floxed to file a comment but it seems they are not participating for some reason. Here is the link to the commenting area: http://www.regulations.gov/#!docketDetail;D=FDA-2014-P-1753 the FDA posted my petition three times… just pick one of the blue “Comment Now” buttons and comment to enhance and speed up the FDA decision-making to remove these drugs from everyday use. In this petition I only asked for Cipro since if Cipro is removed, all others in the same class need to also be removed. 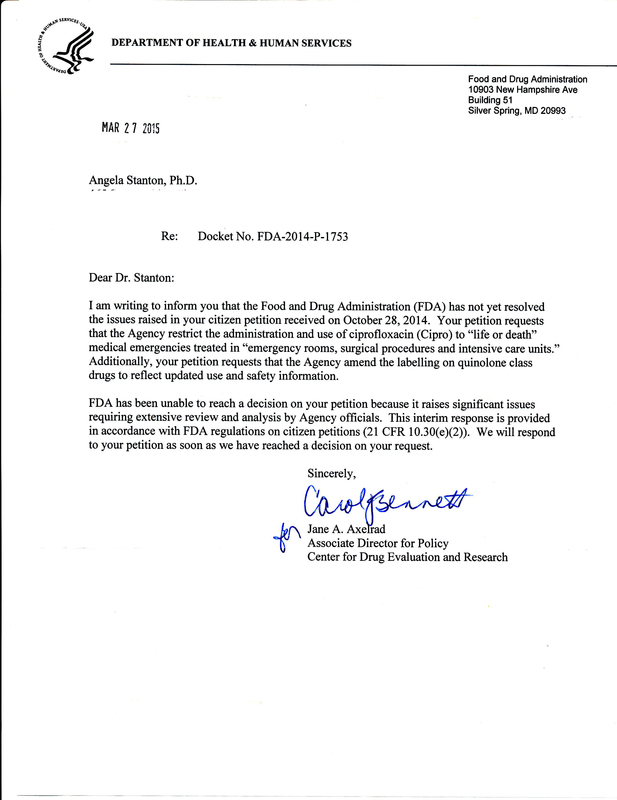 Here is the letter I received from the FDA: https://cluelessdoctors.files.wordpress.com/2015/05/fda-cipro-crossed-out-address.jpg in March of this year! They are ridiculously slow to act while thousands more get injured! Recent research on the benefit of fasting shows that some form of fasting induces cell and mitochondria regeneration from stem cells (at every age) occurring naturally without any medical intervention: http://www.sciencedirect.com/science/article/pii/S1934590914001519 . When cells and mitochondria are generated from stem cells, they are healthy and not damaged. The authors do not discuss if this process changes in people who have been floxed or not but my intuition is that since it is only the bacterial DNA that is damaged and not human DNA, stem cells will give rise to healthy cells and healthy mitochondria that replace damaged cells. This would indicate that recovery may be possible to achieve by following the particular fasting regiment described in this and some other academic research articles. Research is limited in this area since it involves no medicines and thus is typically minimally funded if at all. That does not lessen the value of the research; it lessens the credibility of funded medicine research. I hope that people who were floxed (which includes me) will test this approach at least once to see if benefit is gained. My recommendation to successful fasting: Grain-based diets make it impossible to fast because grains initiate a large insulin response. Insulin in the blood makes one hungry and also, insulin floating in the blood while fasting may increase a person’s likelihood of getting diabetes mellitus (diabetes 2). Hence before anyone embarks on a fasting routine one needs to turn a grain-based diet off, stop eating sugars of all types (including honey) and sugar substitutes as well, and ensure hydration is up to par (salt, potassium and water). During fasting hydration is more important than ever. Such electrolyte pills are available–avoid the ones with sugar or glucose in them because that will cause hunger. From my experience on fasting: water is retained in the body so herbal teas are diuretic. Have some during fasting but no sugar added! For many of us who lost excessive amounts of weight from the FLQs fasting is just not an option. However, I have been told by a researcher that to help damaged mitochondria, tale Co Q10 (or ubinquinol), Alpha Lipoic Acid, Acetyl_L Carnitine and a good Omega 3 fatty acid supplement. I recently posted complaints about these toxins on the FDA’s Face book page, and got the standard “fill out a medscape report, blah blah blah.” These people are criminals. They have known for decades and are ONLY beholding to big pharma. (and the new commissioner just approved, had the bulk of his salary underwritten by big pharma while he was at Duke…and the cycle continues.. I didn’t have any problems with Psoriasis until after I had been floxed with Levaquin. I just now put 2 and 2 together. I have both Psoriasis and Psoriatic arthritis. It started right after receiving Levaquin as a prophylactic before surgery for a torn meniscus. It started right after that. First horrible night terrors, trigger thumb, excruciating pain in the joints with weakness. Lost of bladder control. The list goes on. And then the Psoriasis then the arthritis. 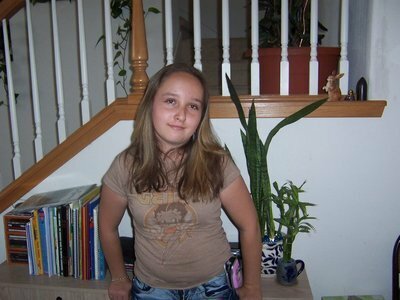 That was in 2008. I am very sorry to hear what happened to you. Indeed, quinolones hurt many people (including me). In some cases the health condition improves by supplementing the nutrition the mitochondria needs (CoQ10 for example and magnesium for cell energy) and often times a complete dietary change can force the generation of fresh new undamaged mitochondria into the cells better than any other treatment. Quinolones damage the mitochondria and so getting on a nutrition regiment that help mitochondria can help the damage caused by quinolones. I recommend you look into what it is and talk to your doctor to see if this is something you can do with your doctor’s support. Not too many medical doctors are familiar with it, like my doctor wasn’t either, but he supports my efforts and connected me with ketogenic nutritional specialist (luckily in the same medical institution) and so I am getting all the support I need. And for me it clearly worked. Best wishes to you and I hope you find a treatment that reverses your condition as well.